Taylors of Harrogate has hired Birmingham agency LIFE to execute a master brand shopper campaign covering itss tea and coffee portfolio. Following a successful shopper marketing campaign for Yorkshire Tea, LIFE has created and implemented a core shopper and below the line (BTL) campaign to support ‘The home of Extraordinary Flavour’ campaign, positioning Taylors as a tea and coffee brand that delivers an intense flavour. 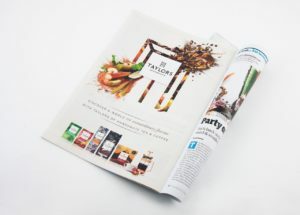 The agency executed the campaign specifically for Waitrose, Sainsbury's and Morrisons, using media touchpoints including retailer press, printed and digital six sheets, retailer.com, in store sampling collateral and point of sale. The master campaign will coincide with two TV adverts created by Lucky Generals, both of which will support the rebrand. Now in its 10th year, LIFE's 50-strong agency with clients including Coca-Cola European Partners, Dr. Oetker, DeLonghi and Whitbread. In 2015 it became part of Leeds-headquartered Communisis PLC.